Another book in the Leadership Library. 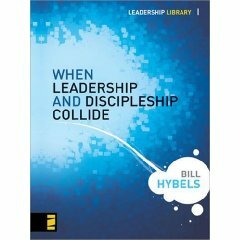 I found this little book packed with some insightful thoughts from leading Pastor Bill Hybels of Willow Creek. If anyone has earned the right to comment, I think he has. Hybels then lists some of these…picking the wrong team, losing momentum, not taking advantage of good PR opportunities, stirring up unnecessary controversy, not leveraging his influence …etc. The idea behind this book is easy to grasp – it’s clearly in the title. People need to be led but sometimes by entering their world, giving of yourself and loving them through circumstances is the best answer. When leadership & discipleship collide…decide on discipleship every time. Defer to the Bible.